When it comes to stubborn pockets of fat, there is perhaps no tougher area than the calves and ankles. These are two areas where fat accumulation is almost solely due to genetics. Thick calves and so-called “cankles” can now be a thing of the past when patients see Dr. Amron for liposuction. As an experienced surgeon dealing solely in liposuction, his technique and artistic eye have been finely honed to provide some of the best ankle and calf liposuction Beverly Hills has to offer. To learn more, please read below or call our office today with any questions. Liposuction of the lower extremities has become increasingly popular in the last two decades. Although it was once considered a procedure that was fraught with complications and unsatisfactory results, improvements in technique are addressing these concerns. Neither calf nor ankle liposuction is generally performed on its own. Instead, Dr. Amron must shape the entire lower leg for the most pleasing results. For this reason, both calf and ankle liposuction are performed as a single procedure to ensure that the proportions of the lower leg are maintained. In some cases, Dr. Amron may also perform liposuction of the knees and thighs to contour the entire leg. In performing liposuction of any kind, Dr. Amron’s biggest consideration is making sure overall proportions are correct. His purpose in delivering liposuction is not weight loss—it is establishing a patient’s natural beauty through removal of stubborn fat. In order to get the best results from liposuction, he takes every aspect of your body into account. When performing calves and ankles liposuction for female patients, Dr. Amron works one-on-one with each to restore proportion and contours in a way that fits them. Click the button to view Dr. Amron’s female calves and ankles liposuction before and after photo gallery. In performing calf and ankle liposuction, Dr. Amron uses a device called a cannula. This is a thin steel tube that Dr. Amron gently inserts into the fat layer of the calves or ankles. By carefully moving the cannula slowly back and forth through the fat layer, while staying perfectly parallel to the skin, he is able to break up the fat cells, which are then sucked through the cannula and out of the body. As with every procedure Dr. Amron delivers, his Los Angeles calf liposuction is done with minimally invasive tumescent liposuction. This means that during the entire procedure, only local anesthetic is used. You are not knocked out, and this technique leads to faster healing and higher quality results than more invasive forms of liposuction. In delivering liposuction of the calves, incision placement is key. Dr. Amron places incisions directly below the knee, towards the top of the calf. By using two separate incisions placed on either side of the calf, he can address the entire calf with smooth, consistent passes of the cannula. By using his artistic eye and total understanding of human anatomy, he can use liposuction to mold the calf into a slimmer, more beautiful shape. 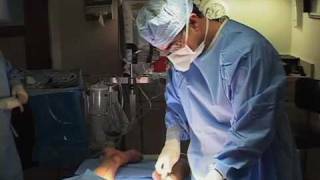 In order to properly deliver liposuction of the ankles, Dr. Amron takes a similar approach. He makes incisions on each side of the ankle that allow him to reach any bit of unwanted fat in the area. Because the ankle is such a small area, Dr. Amron uses his skill to ensure the cannula doesn’t poke the skin from underneath and cause dimpling. In performing ankle liposuction, Dr. Amron precisely removes fat to ensure the ankle maintains its unique shape. During the entire procedure, Dr. Amron considers all factors of your case, including skin elasticity and the proportions of your entire body. In this way, your results are not only beautiful, they are 100% tailored to you, which are some of the benefits of receiving liposuction. When patients come to Dr. Amron for calf and ankle liposuction in his Los Angeles office, they get the expertise of a seasoned liposuction specialist. In order to provide you with the best results possible, he takes an active role in your successful treatment. Rather than mechanically performing any procedure asked of him, he conducts his own thorough examination to determine exactly what treatment will best suit your individual case. With his unique, multifaceted viewpoint, he doesn’t seek to simply treat a single area of fatty tissue. Instead, his goal is to bring proportion and balance to your entire body by considering how each component visually interacts. With his dynamic, integrative approach, Dr. Amron has raised the bar in cosmetic quality. If you have attention on your calves and ankles and are considering liposuction, your first step is an initial consultation with Dr. Amron. During this time, the goal is to reach a complete harmony regarding your cosmetic goals and his professional abilities. You are encouraged to ask any questions necessary to make an informed decision. To find out more about arguably the best calf liposuction Beverly Hills has to offer, please call us today.